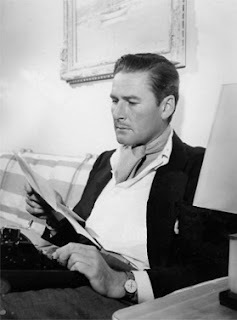 Toward the end of his debauched life, fading Tasmanian-born Hollywood star Errol Flynn spurned the swords and the green tights, grabbed his Royal portable typewriter and headed for Havana for Hearst Newspapers. He arrived in Cuba with photographer Bill Crespinell just as Fidèl Castro’s rebels were preparing to sweep down from the Sierra Maestra to topple the corrupt Batista dictatorship. 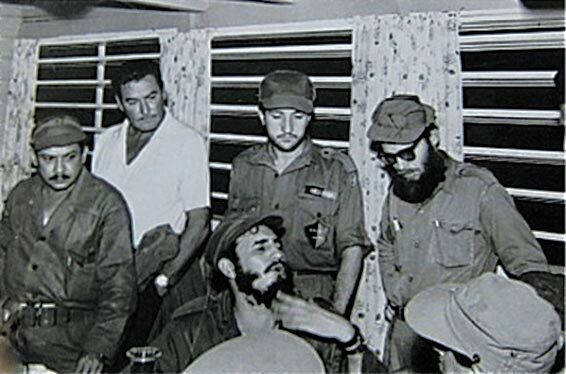 “He was in the fighting zone as a kind of war correspondent,” Castro later told the Los Angeles Times. Flynn's stated rationale? "Ever since boyhood I have been drawn, perhaps romantically, to the ideas of causes, crusades. I wanted to see what makes an idealist tick." And his finding? "Anyone with intelligence is a Communist at 20, anyone who's a Communist at 40 is a fool." But was the real reason an attempt to butter up to Castro to save his investment in a Havana movie theatre, post-revolution? 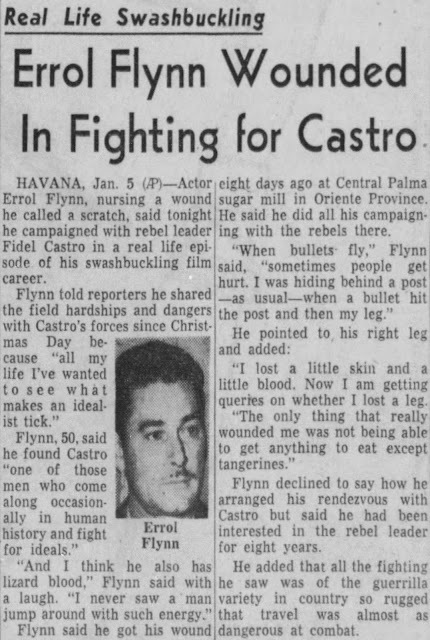 Flynn wrote features headlined "Me and Castro" and "I fought with Castro" for the New York Journal-American after a mere five days, from Christmas Day 1958, in the mountains with Castro. "I feel that the citizens will know who you are ... and it will cheer them to know that someone from the United States, whom they perhaps have seen on the screen, is interested enough to come and see them," Castro told him. In return Flynn gave Castro lessons in public speaking. 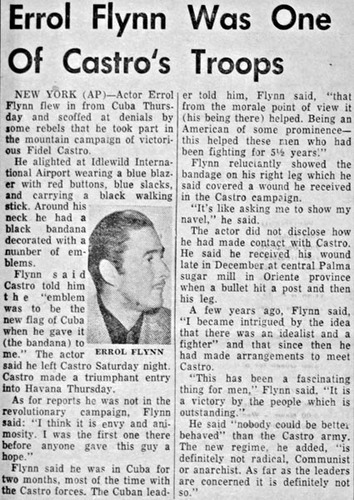 Flynn stayed long enough to see Castro sworn in as Cuban president in February 1959. Back in the US, he appeared on CBC’s Front Page Challenge and naively defended Castro. Nonetheless, his documentary, The Cuban Story, which played once in Moscow and was then lost until a print turned up in 2004, has become one of the key accounts of Castro's revolution. Flynn died in Vancouver, aged 50, on October 14, 1959. 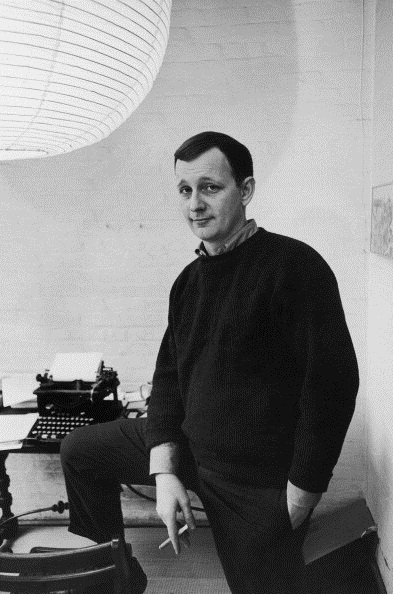 Above: Screenwriter Robert Bolt at his Olympia in 1966. 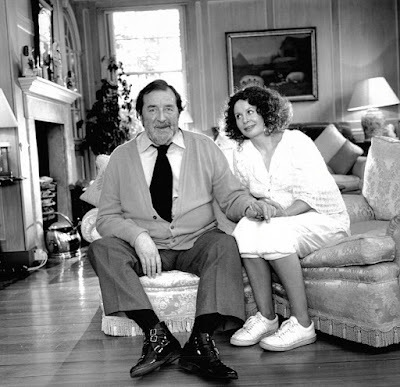 Below: A much older and feebler Bolt with his wife Sarah Miles (they married twice). A fall down the stairs by Miles in 1967 fall didn't disrupt Bolt's typewriting. 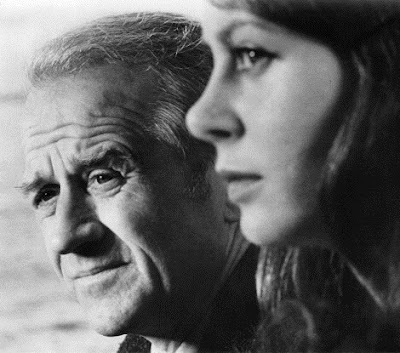 In 1967, English actress Sarah Miles decided to marry screenwriter Robert Bolt, based purely on Bolt's single-minded devotion to his Olympia semi-portable typewriter. Now there's one sensible lady! Miles and Bolt were living together when Miles took a tumble down the stairs. "Robert was typing in the sitting room and I fell down harshly, bang, and twisted my ankle," Miles recalled. 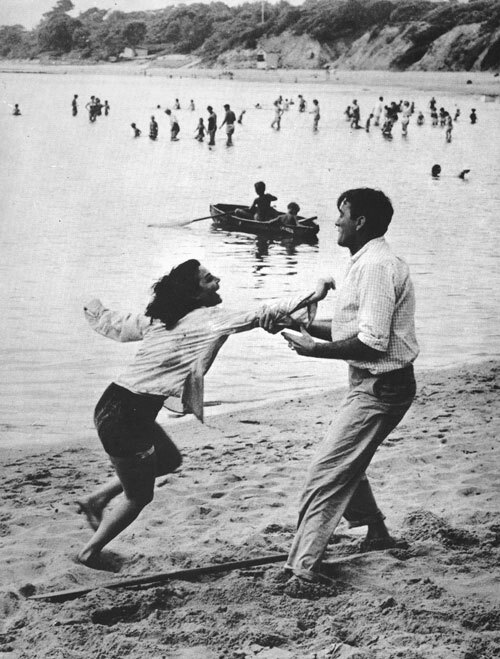 "His typewriter never changed rhythm and I thought, ‘This is the man I'm going to marry'. Until then I'd been suffocated by men." 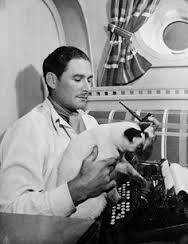 Miles said she was attracted to Bolt's implacable self-discipline and dedication to work - and to his typewriter. Miles with Irish actor Cyril Cusack, my one-time housemate. Miles, who turns 75 at the end of this year, played Patricia in Michelangelo Antonioni's Blow-Up (1966) and Vera in Joseph Losey's The Servant (1963). 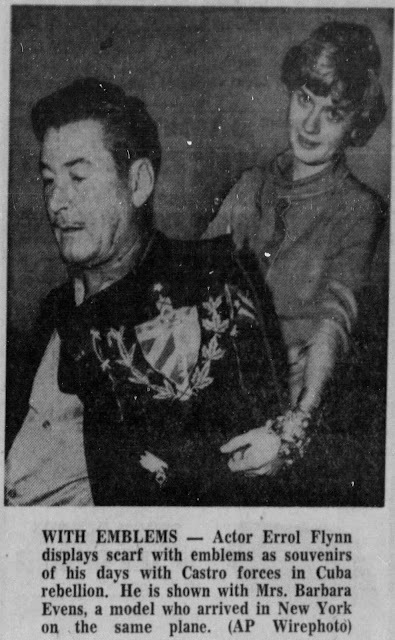 But she is probably best remembered for her Oscar-nominated title role as Rosy Ryan in the 1970 David Lean movie Ryan's Daughter, written by Bolt. 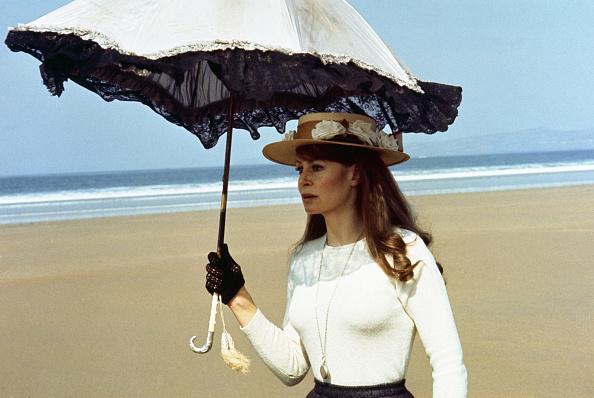 It was filmed on Dingle Peninsula in County Kerry in Ireland. 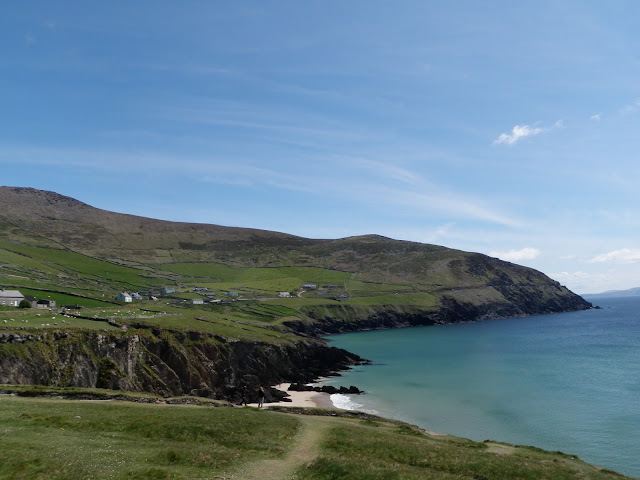 A few years ago I returned to Dingle and followed Miles' footsteps down Coumeenoole Beach there. But it was by no means the closest I'd ever come to this delectable and quite fascinating lady. 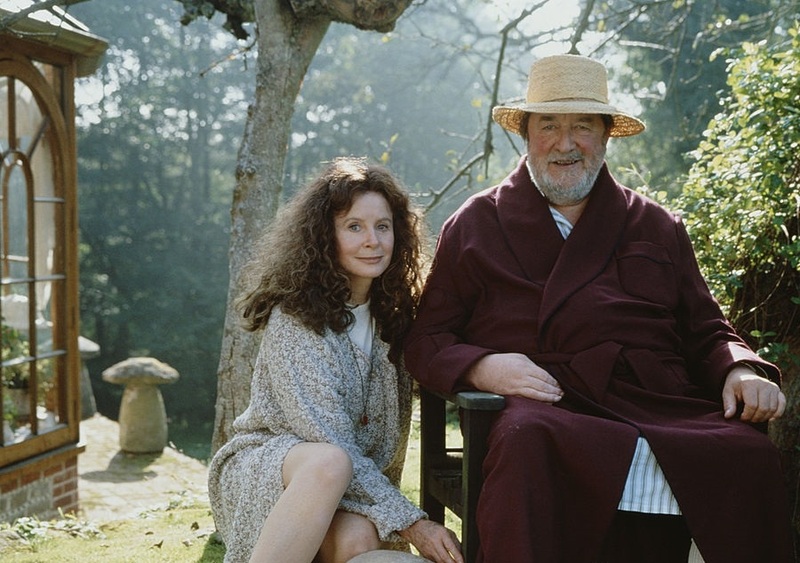 I used to share a house in Dublin with Irish actor Cyril Cusack (the house belonged to his ex-wife), a close friend of John Mills, who won an Oscar for his role as the simpleton Michael in Ryan's Daughter. Miles once visited Cusack and I encountered her on the stairs - I DID disrupt my typing to do so, but she DIDN'T take a tumble! Above, Miles as Rosy Ryan on Coumeenoole Beach at Dingle in Ryan's Daughter. Below, me looking down on Inch Strand in 2010. 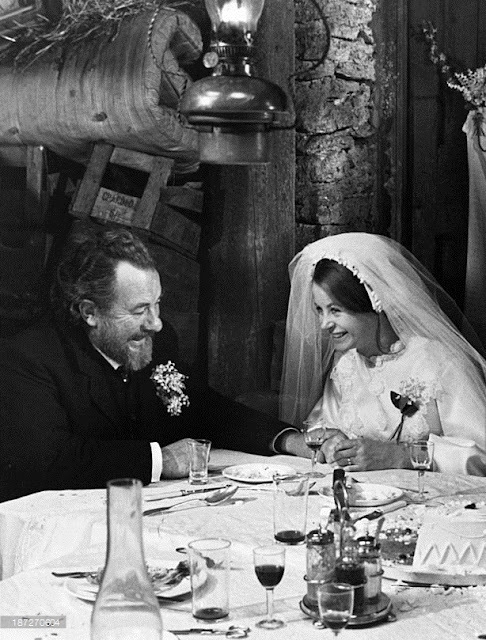 Below that is Australian actor Leo McKern playing Ryan, at the wedding of his "daughter" [Miles] to Robert Mitchum. 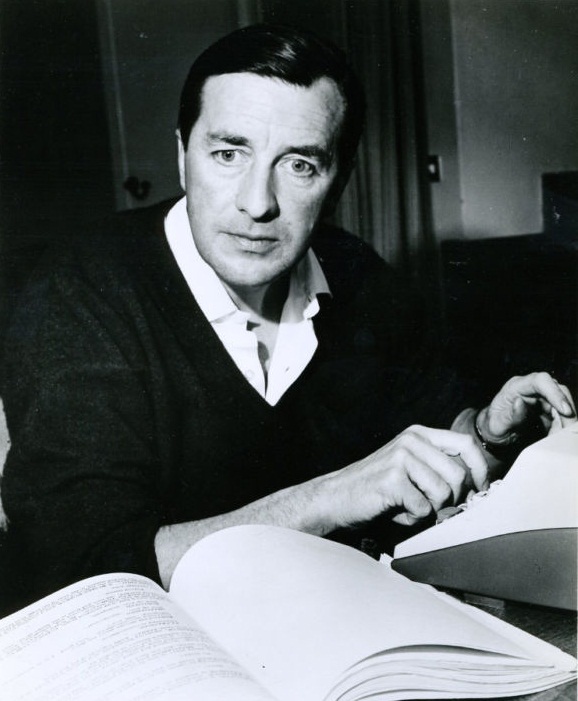 Bolt (1924-95) wrote and directed the 1972 film Lady Caroline Lamb, in which Miles played the eponymous heroine, the lover of Lord Byron and wife of William Lamb, 2nd Viscount Melbourne (later Prime Minister). 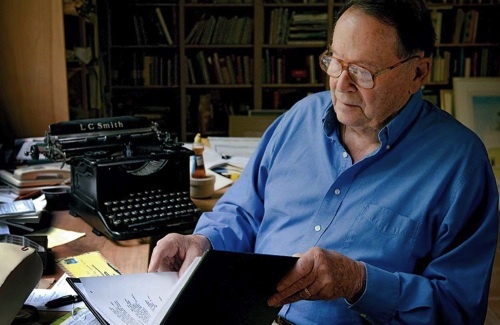 He also wrote the screenplays for Lawrence of Arabia, Doctor Zhivago and A Man for All Seasons, the last two of which won him Oscars. In 1979 Bolt suffered a severe heart attack and stroke which left paralysed down the right side of his body. 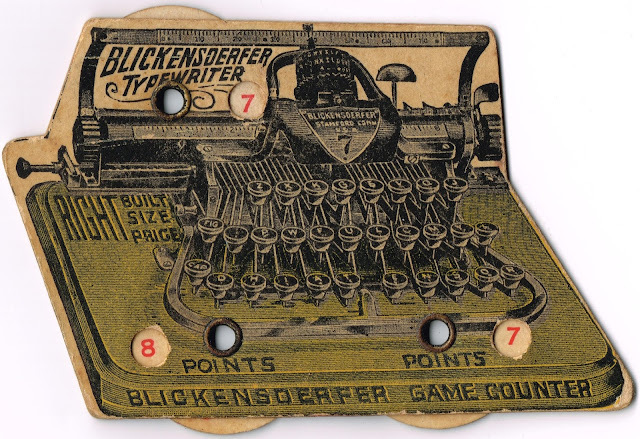 He could not walk or talk for two years, and he was never able to use his typewriter again. 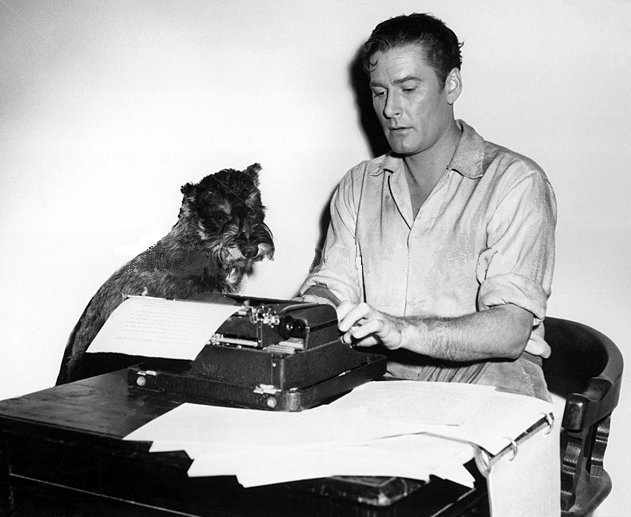 He replaced the Olympia with a word processor and taught himself to tap out screenplays with his left hand. Excitement is mounting to fever pitch as we enter the last three weeks before the Great Sydney Typewriter Gathering on December 14. It won't so much feel like Santa has arrived early, as like all of our Christmases have come at once! This unique event will bring together, for the first time, typewriter technicians Phil Card, Warren Ingrey and Terry Cooksley of Sydney, Melbourne's Michael Klein (an occasional contributor to this blog) and Canberra collector Jim Franklin, who once worked here for Sydney Pincombe Pty Ltd. 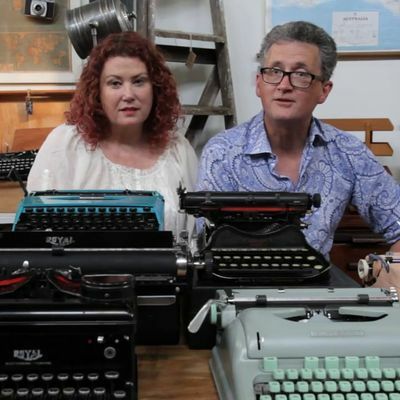 These five typewriter wizards will joined on December 14 by renowned collector Richard Amery, just back from cruising around earthquake-shaken New Zealand, and Charlie Foxtrot owners Phil and Julie Chapman, plus their new business partners. 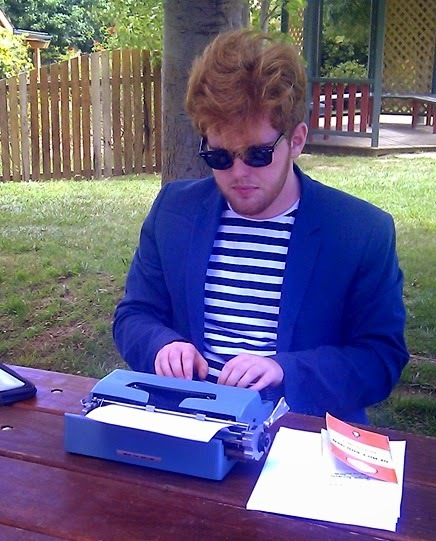 In an attempt to further lower the average age of attendees, another typewriter collector going to Sydney will be the brilliant young Canberra journalist Jasper Lindell. So the occasion promises to be one for the ages. 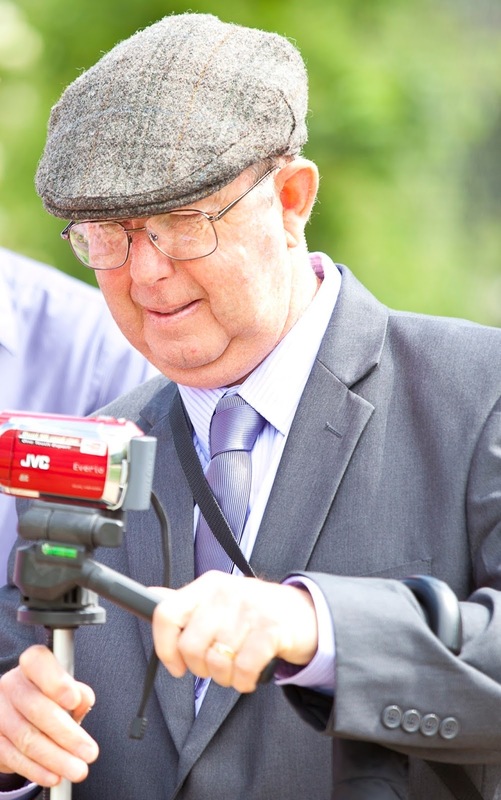 Also invited to this first-ever national typewriter gathering is technician-collector David Lawrence of Auckland, New Zealand, whose presence would turn an already mouth-watering event into an international one. Here's hoping he can make it, otherwise I'll have to wear the Kiwi colours myself. Either way, a never-to-be-forgotten day of typewriter talk and typewriter action is assured ... the Mother of All Typewriter Gatherings Down Under. One-time Cincinnati lass. the 4ft 9in tall Brenda Lee, and, left, Benny Green. In the six years since, Green has ticked even more boxes, and become, at least in my eyes, a model citizen of the world. My friend Bernard Whimpress of Adelaide, one of Australia’s leading book reviewers, has pointed me in the direction of Green’s article “The Pulpit” in last month’s edition of the Literary Review. 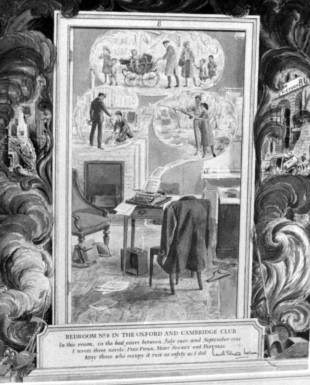 Green opened the piece by revealing he’d written it using a L.C. 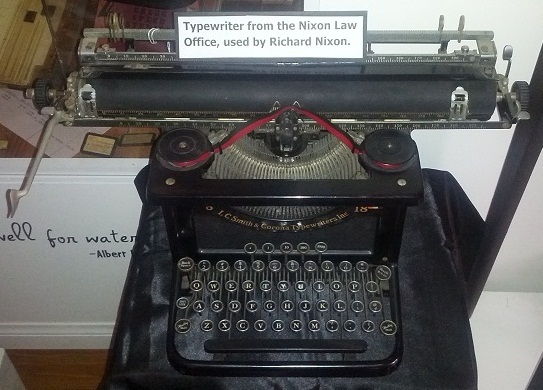 Smith No 8 standard typewriter. 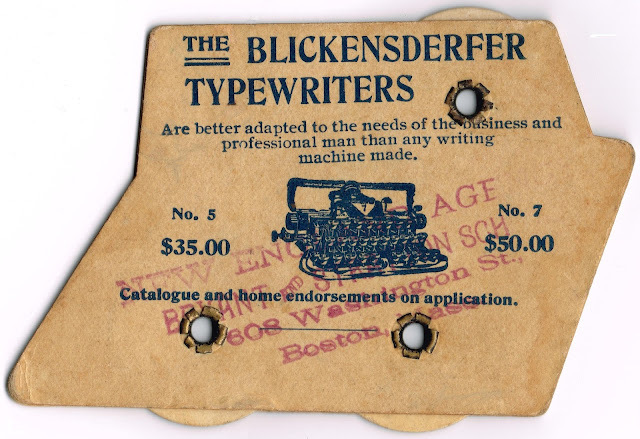 Green, who lives in Cambridge, Massachusetts, then went on to say he’d bought the machine from none other than Typospherian Tom Furrier of Cambridge Typewriter, Arlington MA. Digging a little deeper into the life and times of Dominic Green (1970-), I found he is the son of legendary British saxophonist Bernard “Benny” Green (1927-98) and the brother of another remarkable saxophonist, Leo Green (1972-). These family ties link Dominic Green with all of the above. For me, the pinnacle of Benny Green’s achievements was that he was a member of that wonderful late 50s British band Lord Rockingham’s XI. The name of the group is a clear pointer to Green’s passion for cricket, and sure enough Benny edited and published the Wisden Anthologies, a summary of the famous cricketing annual. 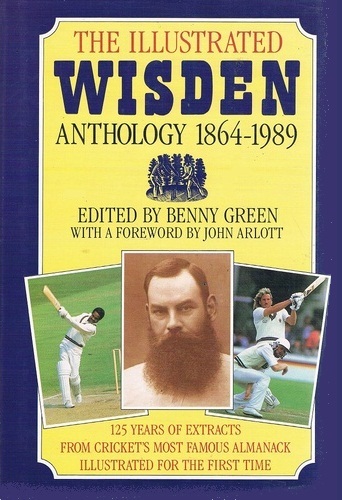 These four volumes cover the highlights from Wisden Cricketers' Almanack from its inception in 1864 until 1989 and stand as a major milestone in cricketing literature. Hoots Mon is a rocked-up version of the traditional Scottish song A Hundred Pipers, complete with such stage Scotticisms as “Hoots mon” (the Australian version of which is “Gidday, mate, how they hangin’?”), “och aye” (yes), "It's a braw, bricht, moonlicht nicht tanicht" ("It's a fine, bright moonlit night tonight") and “there's a moose loose aboot this hoose [about this house]". Benny Green loved the work of P. G. Wodehouse and wrote a literary biography about Wodehouse – who gets a mention in Dominic Green’s Literary Review article. 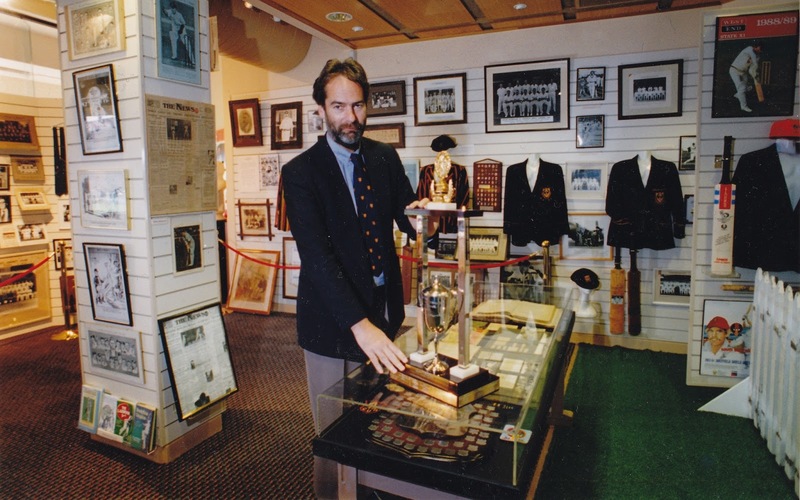 As a keen student of English literature (at St John’s College, Oxford), a musician and an author, Dominic Green closely followed in his father's footsteps. 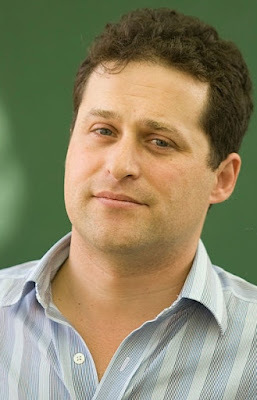 He also studied the history of religion at Harvard. Similarly, his younger brother Leo Green became a musician, broadcaster, producer, actor, musical arranger and concert promoter. 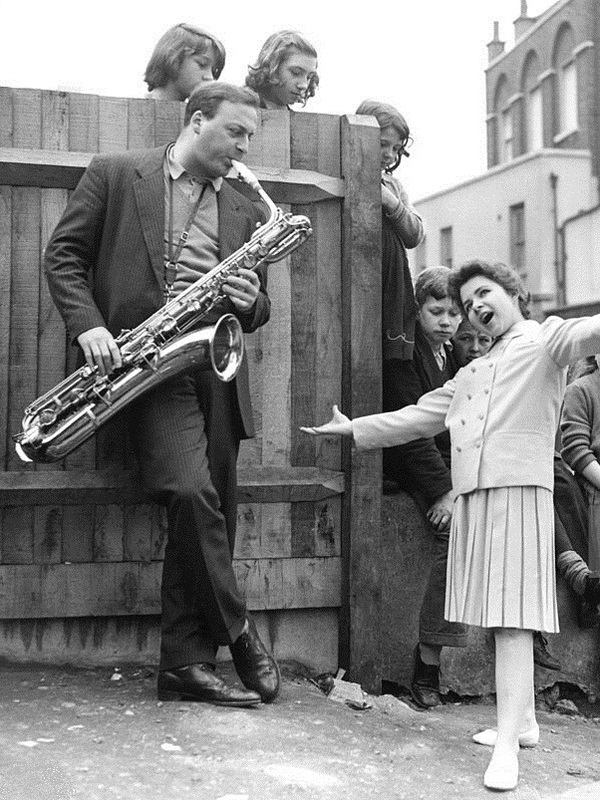 Leo played sax for Jerry Lee Lewis and was long-serving a member of Van Morrison's band. By the age of 30, he had worked with Ben E. King, Bo Diddley, Bob Dylan, , Carl Perkins, Chuck Berry, Dionne Warwick, Elvis Costello, Eric Clapton, Georgie Fame, James Brown, Jeff Beck, Lionel Richie, Little Richard, Paul McCartney, Ray Charles, Ray Davies and Ronnie Wood, to name but a few. 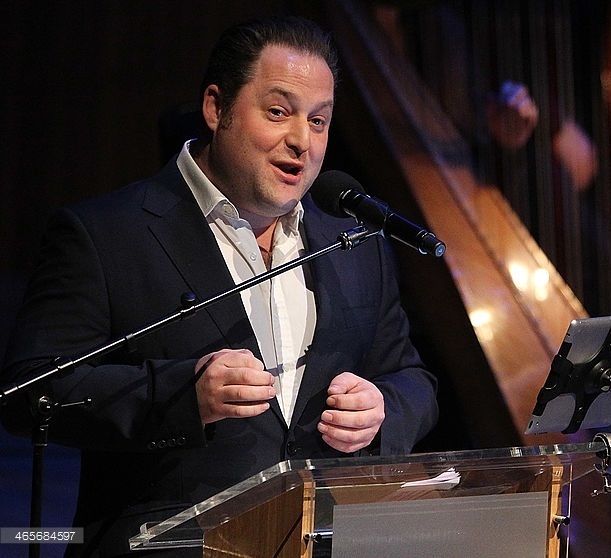 Leo Green was the musical director and conductor for Burt Bacharach and Hal David during their show at the Royal Albert Hall. 2. He uses a typewriter. 3. He has met Tom Furrier. 4. 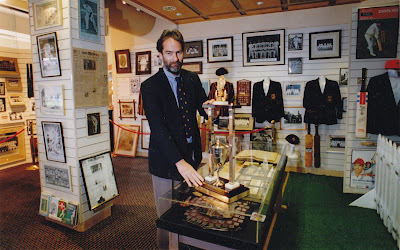 His dad loved cricket, edited my favourite cricket books, and wrote about Wodehouse. 6. And his brother has recorded with all 12 of my all-time music heroes. 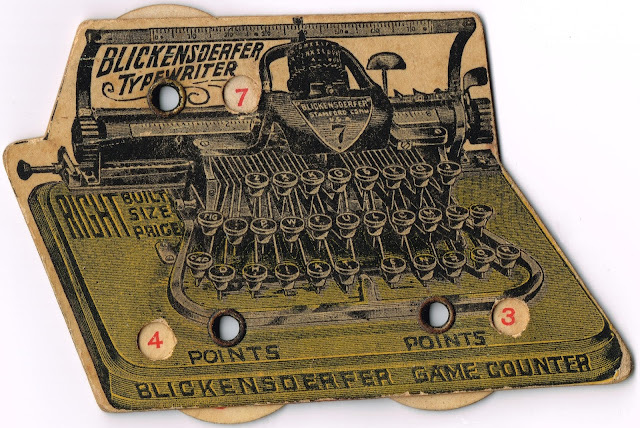 Chicago Cubs win first World Series since 1908: Blickensderfer Typewriters Celebrate! The Chicago Cubs have broken the longest title drought in American sports, beating Cleveland in a thrilling Game 7 to claim a first World Series baseball title since 1908.The Cubs won 8-7 in the first extra inning to complete a remarkable comeback from 3-1 down in the best-of-seven series. "For self-expression, some people turn to the ukulele. 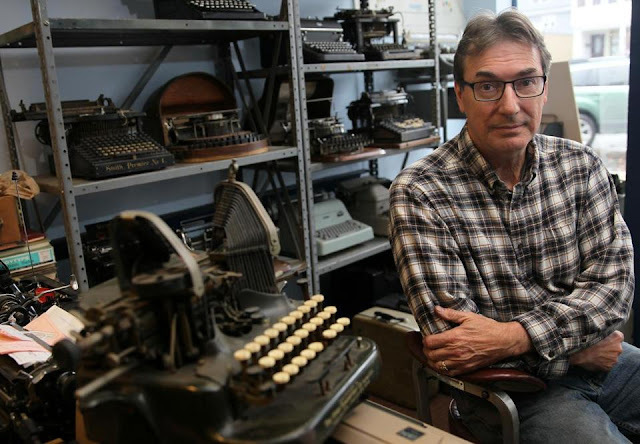 I turned to the typewriter." 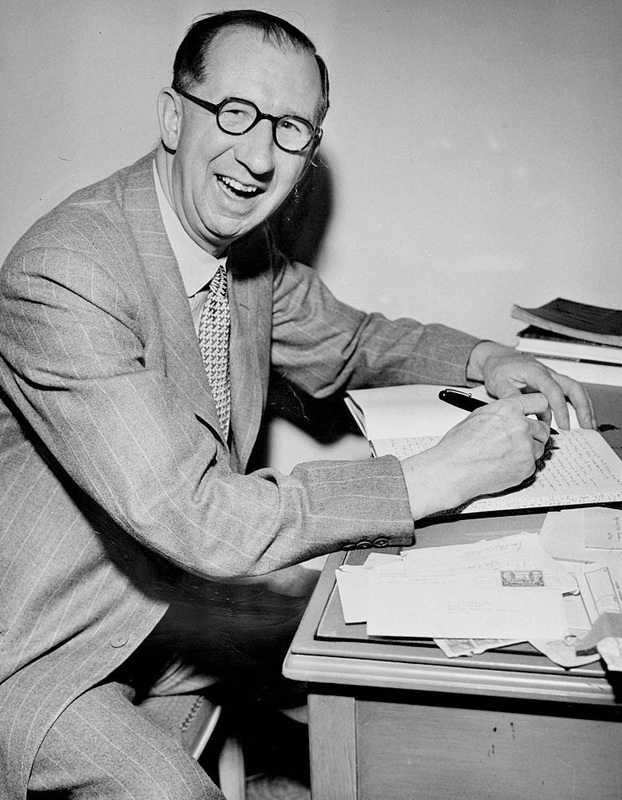 - Nevil Shute, quoted in The West Australian, June 26, 1954. 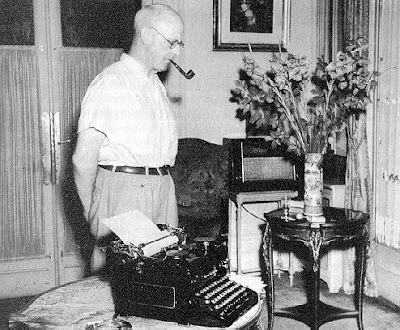 Above, Shute at his portable typewriter, London, April 1950. Below, a scene from Fallout. 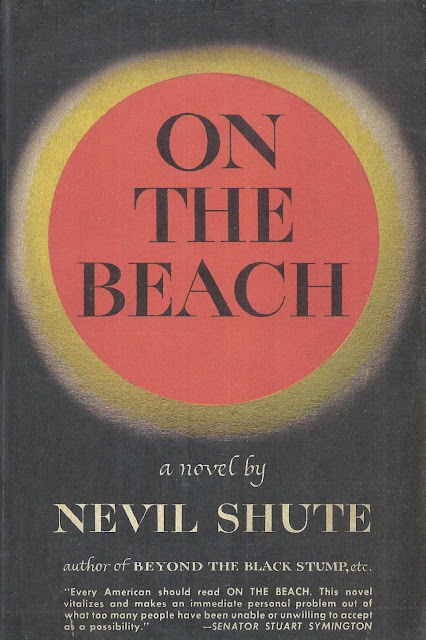 The timing of the Special Broadcasting Service's screening on Sunday night of Lawrence Johnston's outstanding 2013 documentary Fallout, about Nevil Shute's 1957 post-apocalyptic novel On the Beach and the 1959 Stanley Kramer movie based on it, was, I thought, a bit pointed. The more so because, toward the end of it, journalist Gideon Haigh ponders the on-going relevance of Shute's vision of the end of the world. 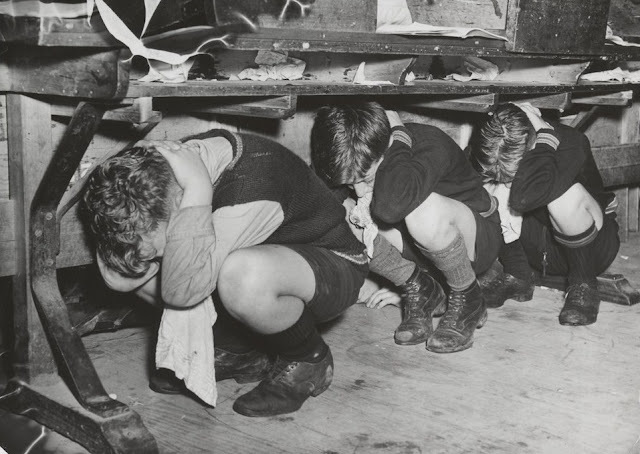 Haigh, saying the threat of nuclear destruction is probably more likely now then ever before, added, "the world is an ammunition dump which one stray spark could set off." SBS seemed to be posing the now appropriate question: Is that "stray spark" - or loose cannon - about to be put in charge of the nuclear codes? How we were taught to avoid annihilation. Not that suitably alarmed Australian viewers can do anything about it, but next week's US Presidential election is of some reasonable concern for those of us living Down Under. After all, in Shute's book, this is where the world ends. And I have a keen recollection of the very real fear On the Beach instilled in us when it was first published - a fear subsequently enhanced by the Cuban Missile Crisis in October 1962. A family album snap of Shute with his portable typewriter and writing desk at his home at Pond Head, Hayling Island, Hampshire, England. Nevil Shute Norway (1899-1960) was an English-born novelist and aeronautical engineer who spent his later years in Australia. His story of the nuclear holocaust, written at his home at Langwarrin, south-east of Melbourne, originally appeared as a four-part series, The Last Days on Earth, in the London weekly periodical Sunday Graphic in April 1957. It was expanded into the novel On the Beach. Shute began writing fiction as a sort of "nancy" sideline in the early 1920s - using a second-hand Blickensderfer typewriter. 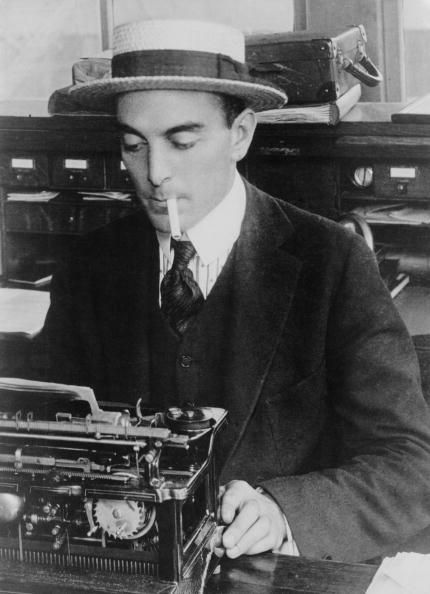 His first two novellas, Stephen Morris in 1923, and the continuation, Pilotage in 1924, both typed on the Blick, remained unpublished until 1961, a year after his death. 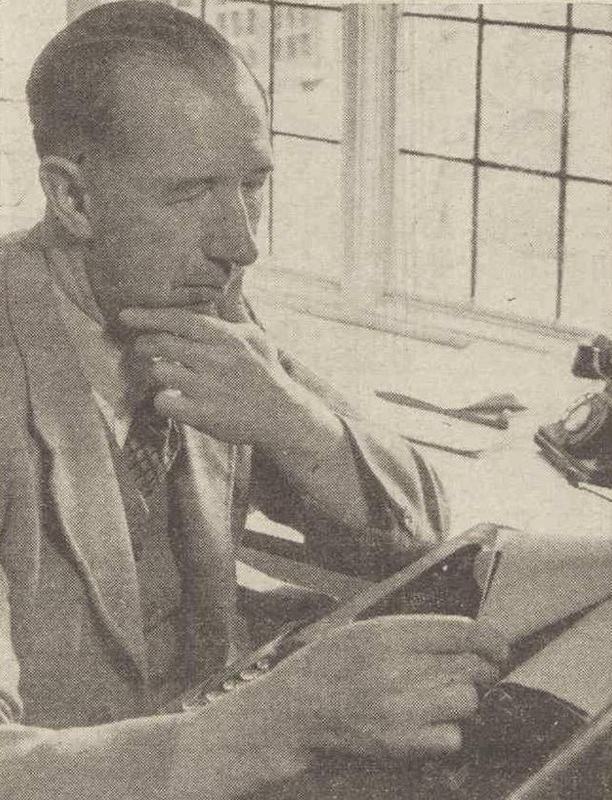 Shute started work as an engineer for the De Havilland Aircraft Company in 1922 and his earnings enabled him to buy a more up-to-date, new portable typewriter in the mid-20s. His first published novel, Marazan (1926), was typed on that. Shute felt it may not have been "quite a coincidence". This later typewriter, depicted in the mural above, was used in "Bedroom No 8 in the Oxford and Cambridge Club. In this room, in the bad years between July 1940 and September 1944, I wrote three novels: Pied Piper, Most Secret and Pastoral." 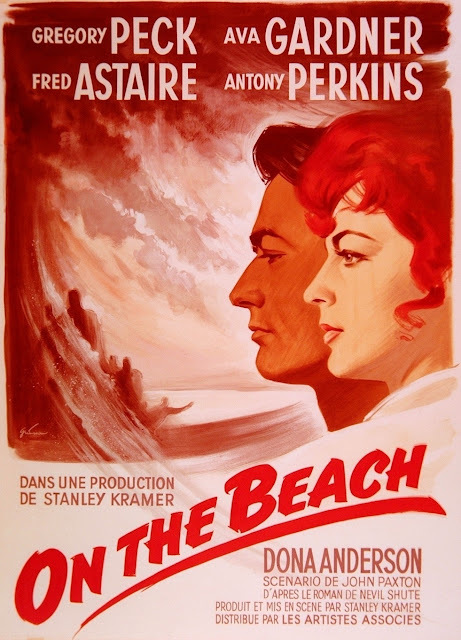 A large part of Kramer's movie version of On the Beach was filmed on location in Melbourne. Female lead Ava Gardner was none too impressed with the then ultra-conservative city, and was alleged to have said, "On the Beach is a story about the end of the world, and Melbourne sure is the right place to film it." These words, however, were actually put together on a portable typewriter by a young Sydney journalist, Neil Jillet, who was covering the filming. 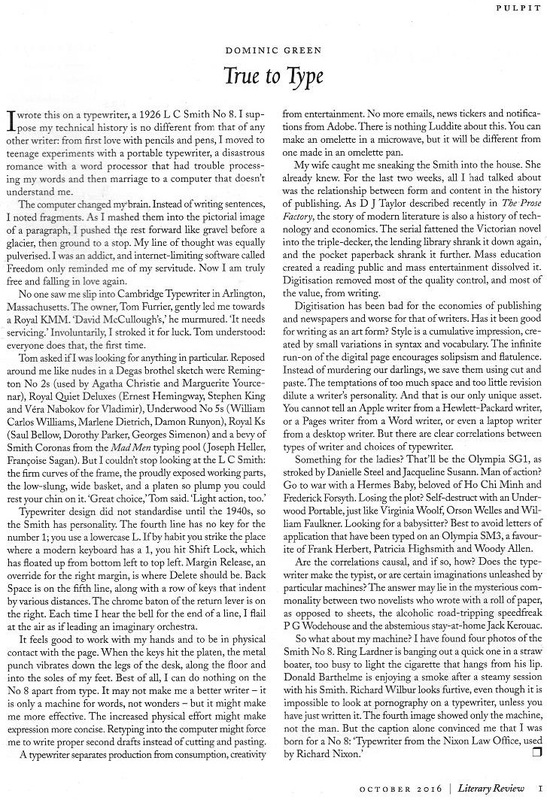 Jillet, unable to get an interview with Gardner, typed: "It has not been confirmed that Miss Gardner, as has been rumoured at third-hand from a usually unreliable source, if given the chance, would seriously consider whether, if she managed to think of it, would like to have put on the record that she said: 'On the Beach is a story about the end of the world, and Melbourne sure is the right place to film it.'" Unfortunately, a clumsy sub-editor put these words in Gardner's mouth, and she had to live with them for the next 30 years. "Get me out of this bloody dump," pleads Ava.